SafeGuard always strives to take student safety a step further. With our innovative SmartFrame technology, we’ve done just that. SafeGuard seat sare the only seats on the market that come with enhanced compartmentalization thanks to our SmartFrame and SmartFrame+ technologies. No other seat manufacturer has anything like it. School bus drivers can’t always ensure that every student remains in their seats, belted for the duration of every ride. Watch the technology in action, and see for yourself the difference it can make in keeping belted and un-belted students safer in a frontal collision. 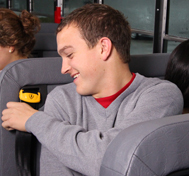 Beyond the considerable benefits this technology will bring to your school buses, it also offers simple access and easy service of restraint systems and upholstery.